Yesterday I planned a picnic for my sister and her family, and shared the story about how and why I created the menu: to welcome them on their first evening in California with a meal that was delicious, familiar, and healthy. The picnic was a huge hit! At the end of my post, I promised to share recipes in the coming weeks. I will keep that promise, but first I thought I’d share where some of the inspiration for that meal came from. I make a lot of things from scratch in my kitchen but I confess I’ve never made my own nut butter until yesterday. Like most people, I pick up a jar of peanut or almond butter at the grocery store without considering making it myself. 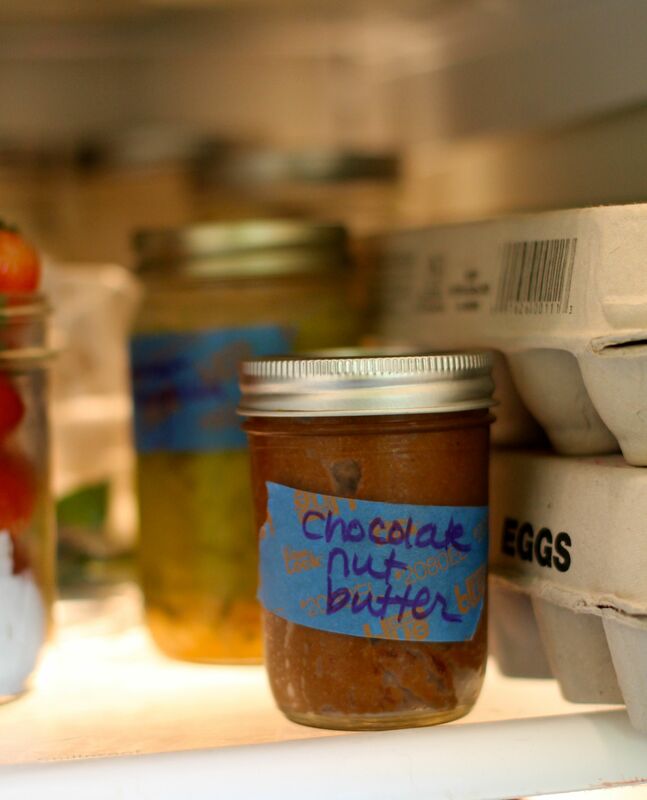 Peanut butter is an essential pantry item at the bungalow, and almond butter is not too far behind it. Aside from a generous schmear on fresh bread, I use nut butters for cookies, granola bars, and in my morning oatmeal. The idea to make my own nut butter came from my friend Amelia Winslow, who posts to blog I follow called Eating Made Easy. Amelia is a good friend of mine as well as a culinary colleague. Aside from being gorgeous, smart, and really funny, Amelia shares her common-sense nutrition advice, very patiently I might add, whenever I need it. But because she is also a chef, she puts a very high value on flavor, creating delicious dishes that have a myriad of nutritional benefits as well. Amelia makes sunflower butter in her food processor each week. I’ve never made (or eaten, to be honest) sunflower butter, but her post got me thinking about the mason jar of mixed nuts in my pantry. They’ve been hanging out in there for a while, and I knew that I needed to use them up. I also knew that I had forgotten to pick up a fresh jar of peanut butter when I stopped by the store the other day, so I figured I would give it a shot. My sister had, after all, asked me to put PB & J sandwiches on the picnic menu. Making your own nut butter is CRAZY SIMPLE. Throw nuts into your food processor, pulse a few times, and then let it run until the butter is as creamy as you like it. I wanted mine to be really creamy, and also a little chocolatey, so I added some cocoa and vanilla extract. The mixed nuts I used were already roasted and salted, which was ideal in terms of making it easy for me but also made the nut butter a little too salty. So I added some honey to balance it out, a step which simply required me to dump some honey into the food processor and let it whirl a bit longer. It was so simple. And delicious. And fun to make! Check out the recipe for sunflower butter on Eating Made Easy. While you’re there, I’m guessing you may get distracted by all the great recipes and advice that Amelia shares.